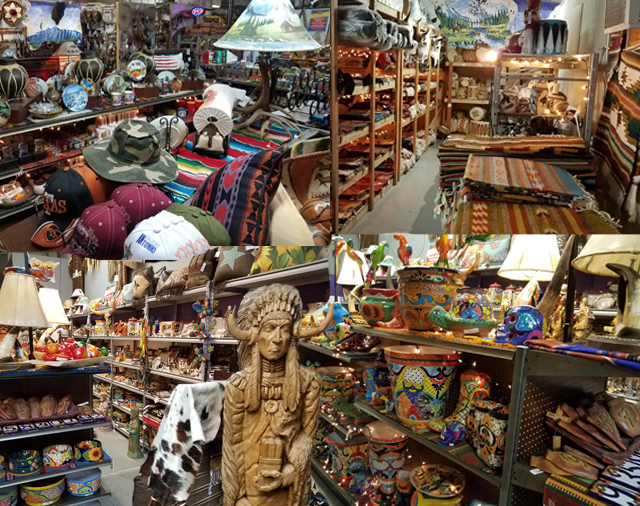 Souvenirs, Gifts, Decor, Apparel, Jewelry, Pottery, Baskets, Moccasins & Much, Much More! The Mission Del Rey warehouse and showroom can be a bit tricky to find but well worth it. With thousands of items in stock, people think of it as hidden treasure. We offer all El Paso Saddle Blanket products and much more... direct to the public. From I 10, take exit 30 onto Lee Trevino Dr.
Go North 1/2 mile to Pellicano Dr. Turn left (west) onto Pellicano Dr., then left into The Quadrant, beside the big marquee street sign. You will see our signs on the marquee and in the middle of the building. GPS Confusion: Our address, 1421 N Lee Trevino, may take you to the first building along Lee Trevino Dr. We are in the third building back. It's easier to enter from Pellicano, but you can cut through from Lee Trevino Dr. also.